No need to be inelegant when savoring a lazy afternoon lunch or dining under the stars. With a sewing machine and a spare half hour you can whip up a tablecloth or two custom-fitted to your umbrella table. 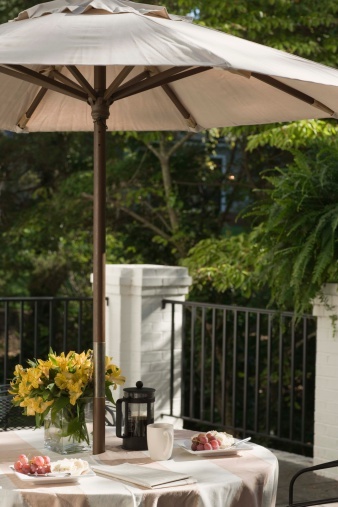 A tablecloth for an umbrella patio table needs a hole in the center and some way to get the cloth on and off the table without disassembling the entire table and removing the umbrella. Make a summer's worth of cloths, from pale linen to bright oilcloth, and party in style. Cloths for your elegant patio brunches need a hole in the middle. Measure your table. The size and shape will determine how you buy and cut the fabric. Take the diameter of a circular table to figure the width of the fabric you will need. Design any length from a cloth that just covers the table to one that sweeps the patio pavers. Purchase fabric. Match patterns to the patio furnishings and cushions or to the umbrella or blooming flower colors. Make a few tablecloths from a variety of materials: washable linen, cotton and oilcloth. Oilcloth comes in amazing vintage patterns and can be wiped off or even dropped in the washer. And you won't have to hem an oilcloth tablecloth because the edges of oilcloth don't unravel. Cut the cloth to fit the table. One way to do this is to cut two halves you will join together. One half should be 2 inches wider to accommodate the overlap for the opening. Mark the hole for the umbrella in the center of the joining edge and cut it out on both pieces. Make a narrow hem on one center edge of the narrower piece of fabric, from the umbrella opening to the outside of the cloth. Make a wide hem on the wider piece of fabric on the opposite side, from the umbrella opening to the outside edge of the cloth. This is the piece that will slip under the narrow open side and fasten with Velcro to keep the cloth on the table. When you are finished you will have two pieces of fabric with half circles at their centers and half of their center edges hemmed. Place both halves of the cloth with their right sides together and sew the center seam of the remaining side from the center umbrella hole to the edge of the fabric. Trim the seam and press it open. Fold the edge of the umbrella circle under and stitch it down, leaving it open on the side where the tablecloth splits. For stiff material, you may have to make tiny darts around the edge of the circle in order to fold it under without wrinkles. Try the cloth on the table to be sure it lays flat around the umbrella pole. Mark the cloth for the Velcro closure strips and remove it from the table. Sew Velcro strips on the underside of the narrow hemmed fabric edge and the top side of the wider hemmed fabric edge. Line up the Velcro so that the wider hemmed half slides right under the other piece and both pieces lay flat when pressed together. Hem the outside edge of the tablecloth and press all seams and hems. If you opt to use buttons instead of Velcro, cut the fabric wider for both sides so both pieces will overlap along the center seam, giving you room to sew both buttons and buttonholes. Make a wider seam on the non-buttoning side to use up the excess fabric. For a big decorative zipper, cut the fabric slightly wider and put in the zipper before seaming the opposite side, turning under the umbrella opening and hemming the entire tablecloth.